My heart is heavy. No, it downright hurts. I am seeing too much hurt and heartache surrounding me lately. What do you say to a friend who was just told the baby she is carrying is not going to survive? What do you say to the friend laying on her death bed right now….waiting for her beautiful homecoming with the Lord in just hours or days. What about her husband of just a short time who is with her by her bedside? Then there is the husband who lost his wife of a short two years that we ran into eating at the restaurant alone….something he has been doing for the last two years by himself. What about the children who lost their mother from the big”C” at Christmas time who are now trying to do life without the most wonderful thing in their lives? I don’t know if I have all the answers, but I do know that I have a Lord who cares and who gives us hope even when things seem so tough and heart wrenching as death. I know He will walk beside us guiding us through our suffering. You say how do I know this, because He was there for me in my darkest days. He stood right along side of me and guided me through my unbelievable grief. Every step of the way…He was there. When I needed to face my boys and tell them the little brother we were all excited for had died and he was now in heaven, He was there. When I needed to stand at my babies graveside and bury him, He was there. When I had to walk past the nursery where he should have been every Sunday morning, He was there. Yes the Lord was there every step of the way guiding me, loving me and showing me the way to walk this life, leaning into His loving arms. He has walked along side of me for the last 23 years guiding me, loving me and being there for me in the good times and the dark times. He was my light in all of the darkness. He continues to shine His light in all of it splendid Glory! Not just for me, but for all of us. He said there would be suffering and sometimes more than we can bear, but He will be walking right beside us through the rough times and at all times. Through the years He has shown me how to cling onto Him and trust in Him. Why did the baby we didn’t plan for that He gave us and we were so excited for, why did He take baby Tyler home before he(Tyler) had time to spend with us outside the womb? Why did my girlfriend get pregnant, when it clearly was a miracle that she did, to only now find out the baby she is carrying for 5 months will not survive. I won’t tell you I have the answers because I don’t, but I know my God is a big God and He has the answers and He has the plan all figured out. Why is my friend who is on her death bed, get the big “C” after giving and serving 13 years overseas as a missionary telling others about her Jesus. Why are my friends children now going on life without their mother? Plain as I can say it, I don’t know, but I do know one thing….Heaven holds so much for us if we believe in the Lord and accept Jesus into our hearts and ask for the forgiveness of our sins. We will have a chance to see our loved ones who have passed into His loving arms~face to face with our Jesus when our time here on this earth is done and we pass onto Heaven for Eternity. If we don’t accept Him into our hearts and surrender all control over to Him and ask for forgiveness of our sins we look at the possibility of living in Hell for Eternity. I cling to the Truth and all God has for us in His Word. I pray for my two friends who are being met with unbelievable circumstances and grief. I get on my knees and pray on their behalf crying out to the Lord for them. I know He hears me and I know He will walk along side of my friends. And I keep repeating the Lord is good…the Lord is good…the Lord is good. I am loved. I trust Him! I recently shared on Facebook how I made pizza on the grill. A girlfriend had been sharing with me for sometime how good it is when you make it on the grill. I finally tried it a couple of weeks ago and we all loved it, so much that is has become a regular for my family. So people have been asking how you do make pizza on the grill? I just made it today for lunch and unfortunately only remembered to take one picture ~ so I will walk you through the process. 1. 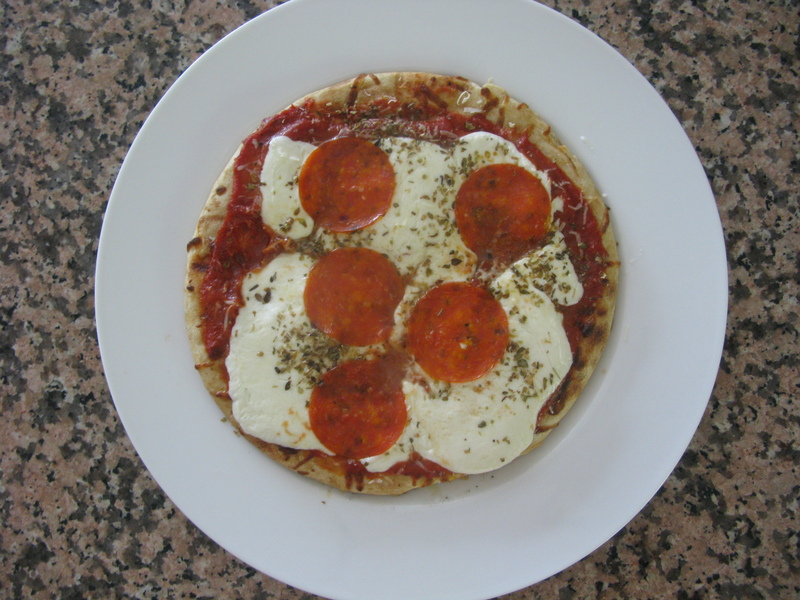 Start with a pizza crust – for an easy good crust I will use Boboli for this explanation. I used the mini original crust today and I first brushed olive oil on the tops and put on the grill on low for about 3-4 minutes. Then I coated other side(bottom) with olive oil while on the grill. Take off the grill, so you can put your toppings on. I used pizza sauce, fresh mozzarella cheese and some fresh grated Romano cheese and some pepperoni. I also topped with oregano(I usally use fresh but used dried today). 2. Then I put back on the grill for about 4-5 minutes on low or until the cheese is melted. 3. Easy step-just eat it! See it is very easy and very fast plus you do not have to have the oven on in the heat of summer. Enjoy your summer weather and enjoy some pizza on the grill!